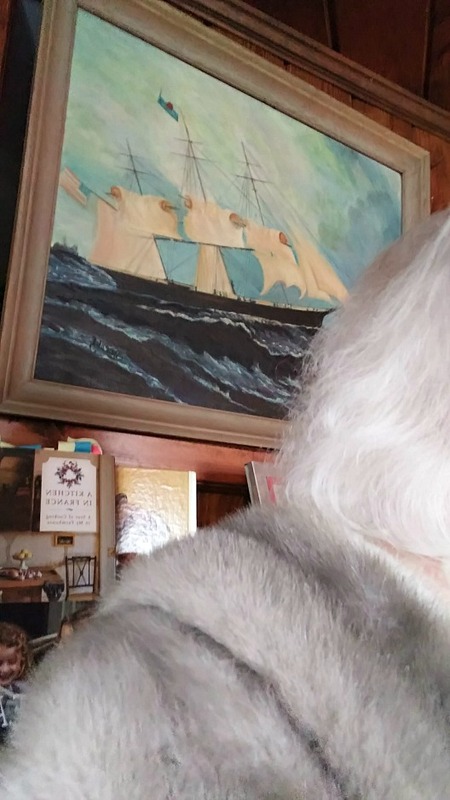 On November 3, 2016, I wrote a post here called "The Shorter the Sleeves, the Longer the Gloves," and had a photo of myself wearing my mother's silver mink stole on my honeymoon many decades ago. When I found the photograph above, another one of me from our honeymoon, it reminded me that I had intended to do a followup discussion of furs but with the move back to Tennessee not long after that it never got written. What better time for it than now during the bitterly cold weather across much of the U.S. and Canada? In comments at the old post, here, many friends wrote of still wearing fur coats or jackets in cold weather, especially ones from consignment stores even if they might not buy new ones sold today. One woman even wrote that she had once lived in the Yukon and wore fur, where I would guess it makes not just perfect sense to wear them but good sense also. I imagine there may have been many women in the Chicago area who wore theirs this week, if they ventured outside. 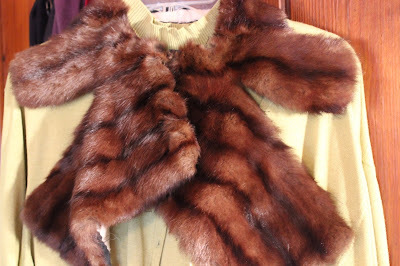 Deborah of The Beautiful Matters wrote that she had some fur collars she loves found at consignment stores and I thought of her when I spotted this one at a local antique mall after Christmas that was 50% off and cost me a big $10. I could not resist that bargain and it feels so soft and warm around my neck and reminded me of the mouton fur collars my girlfriends and I wore in high school with a sweater set and form-fitting wool skirt with a kick-pleat. We really dressed up for school back then! I don't know if I'll ever get up my nerve to wear it anywhere but if I do I think I'll buy a piece of soft lining satin to line it with. There's even a little hook and eye at the neckline that is broken so I need to replace that. And that's all you're going to see of me in it for now because a jillion attempted selfies did nothing but show how frizzy my freshly shampooed hair was and that I badly needed to visit a professional makeup artist first. 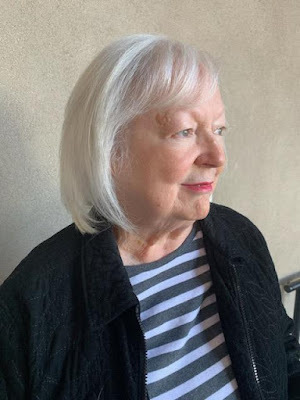 I splurged on a good haircut in downtown Nashville a couple of weeks ago so I will show you pictures the stylist took of me afterwards, even though lipstick was all I'd taken time for that day. Why can't I blow dry my hair that smoothly? I've decided that RH needs to go to hair salon school so he can do it every morning for me. And learn to be a makeup artist. Don't you think he should do that? 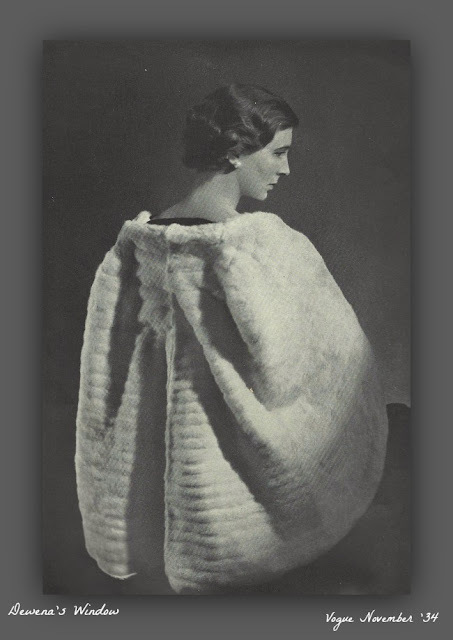 Then I could wear my mother's 60-year-old mink stole almost as elegantly as Princess Marina of Greece did in the picture below in 1934 in Vogue magazine when she was about to be married to H. R. H. Prince George of England. Her fur is an ermine cape from Molyneux, who also designed her wedding gown. Isn't it gorgeous? I treasure the old Vogue magazines in my collection and can spend hours reading every single word in them, even the advertisements, and swooning over the beautiful clothes and furs. I wish so much that I had a photo of my mother wearing her mink stole but my sisters and I couldn't find a single one of her in it for this post. We still remember how exciting it was when our father surprised Mama with it and how perfectly elegant she looked in it, the silver fur lovely with her hair that was dark as a raven's breast. Another surprise came to Mama much later in life when her sister invited her on a Mediterranean cruise. On it she had the joy of visiting Greece herself. I have a copy of her itinerary still and read it again today. 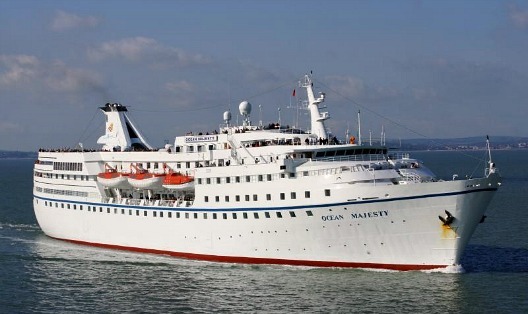 She arrived in Athens in October of 1997 aboard the Orient Lines' the Ocean Majesty, which I understand is now operated by a German cruise line. She and her sister Marty toured Athens for two days and then went back to the ship for ports of call at Delos and Mykonos and then on to Santorini. They also travelled to Rhodes and to Kusadasi and then on to Istanbul. I'm so grateful that my dear mother, the first Dewena, who I was named for, was given the opportunity for this trip of a lifetime by her sister. What a great time they had with lots of stories to tell us! 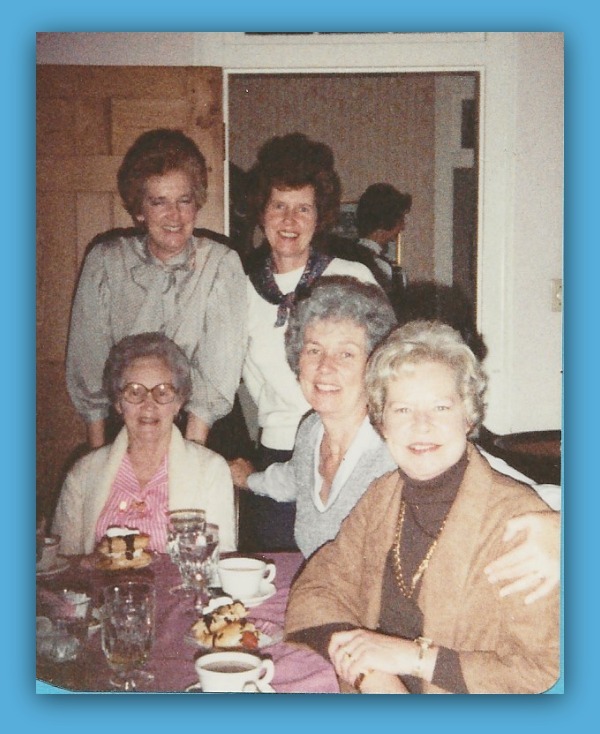 My mother had four sisters and they were all very close, seeing each other as often as they could. That's when the fun really happened. Oh, those sister parties at Myrtle Beach! Only Mama, the oldest of the five girls, and June, the baby sister, are are here with us now, the three middle girls now in their heavenly home. Here is Mama sitting next to her mother, with three of her four sisters, celebrating my grandmother's birthday. I've thought a lot about these beautiful women while writing this post. I grew up in the elegant age of the 1940s, 1950s and early 60s and remember how beautiful my mother and aunts were, dressed up in their finest. Whatever our view of wearing fur is now, we all must admit that the early part of the 20th century was certainly a glamorous age, wasn't it? I never could see why women could be seduced with jewels, but, oh, I'm sorry for those who are tempted too far by furs! I should like to be swathed in them. I don't care what they say: I love fur; I read National Enquirer; I rarely recycle; I think Prince Charles and Camilla deserve to be happy. I loved this story! I am a huge anglophile and have a huge library on the British royals; Princess Marina passed away, from a brain tumor, at Kensington Palace at 11.40 am on 8/271968, aged 61. Her funeral service was held at the St. George's Chapel on 08/30/1968 and she was buried in the Royal Burial Ground, Frogmore. By the way, her funeral was the final royal ceremony attended by her brother-in-law, the former Edward VIII (Duke of Windsor). Thank you so much for this info, Dawn! I love the Royals too, something my husband can't understand and maybe I don't myself. Just can't help it! There's a beautiful youtube video of photographs of Princess Marina if you haven't seen it. Love your hair, you're right great cut. Won't be taking mom's furs, some were grandma's. Hope my sister takes them. I did buy a pair of Italian mink boots with wool lining for work, from TJMaxx, and not cheap, even there. Label said all was farm raised. I will wear those work boots till I'm dead. Sweet life your mom & her sisters. Thank you for sharing them. All beauties too. Thank you! And those boots sound fabulous for work boots, so glad your feet will be warm while you work outside. You deserve them! I love when you take trips down memory lane! So interesting to read of times past and about your mother. I didn't know you were named after her! Well, as you know, I'm in Chicago (the suburbs) and it is bitter cold here, but no fur for me! I've never been a fan. And no one here wears it anymore - at least, not that I've seen, not even in Chicago. Probably too controversial these days. My grandma and her sister (my great-aunt) were big fans of fur. 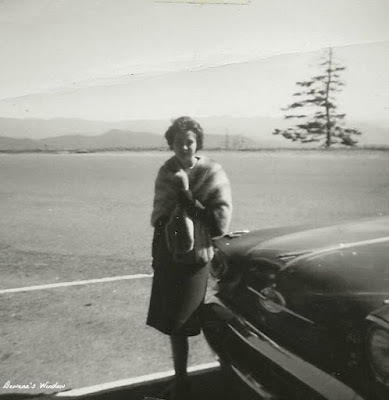 My great-aunt had several coats and "shrugs" (is that what you call them)? She was a very elegant lady, always dressed up. I think my mom might now have a couple of her furs, as my great-aunt and my mom were/are both tiny women. My grandma used to buy me and my sister rabbit fur coats when we were little. They actually weren't very warm and shed like crazy. And our cat would try to eat them, ha ha! I remember our cats loving the rabbit fur coat our daughter had! And I'm sure you're right, it would be too dangerous for a woman in Chicago or New York City, maybe, to wear fur. I wonder then, who has bought all the gorgeous expensive furs that the women of the big cities used to wear? I would buy them in a heartbeat at a yard sale, for the right price! I hope it warms up soon for you there, Melanie! I agree, you grew up in a very elegant time, Dewena!! I look back at how women dressed back then and it's a far cry from the tunics and leggings I wear to work! 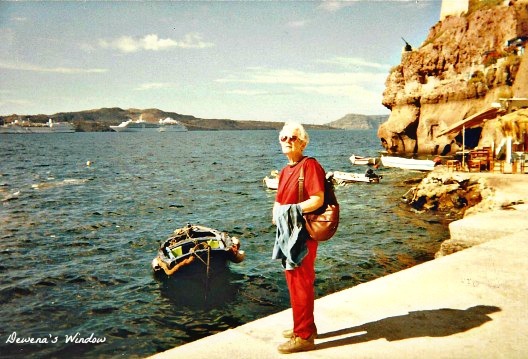 Gorgeous photo of you, and I love the one of your mom in Santorini - my daughter travelled there two years ago and adored it! Debbie, you would look elegant whether in tunic and leggings or your garden garb! You should show your daughter the Santorini harbor pic and see if she recognizes it! Love your new 'do'. Your hair color is beautiful as well. Times are not very elegant these days. Thank you so much, Lorraine! I hope you have a wonderful weekend at Plum Cottage too! You wrap yourself up warmly in that beloved coat, Barbara! You will look elegant in it! What an interesting trip down memory lane. Travel wasn't quite as common a few decades ago, and trips were really special events. That's not to say that they are not, still, but many more people travel. I, too, am a great royal fan and enjoyed this tidbit about Princess Marina. Fur would be too warm for our climate, except on a very few days, but it's very elegant. I'm always surprised to see that you really do live in a moderate climate, Lorrie. I have to remind myself that not all of Canada is cold now! 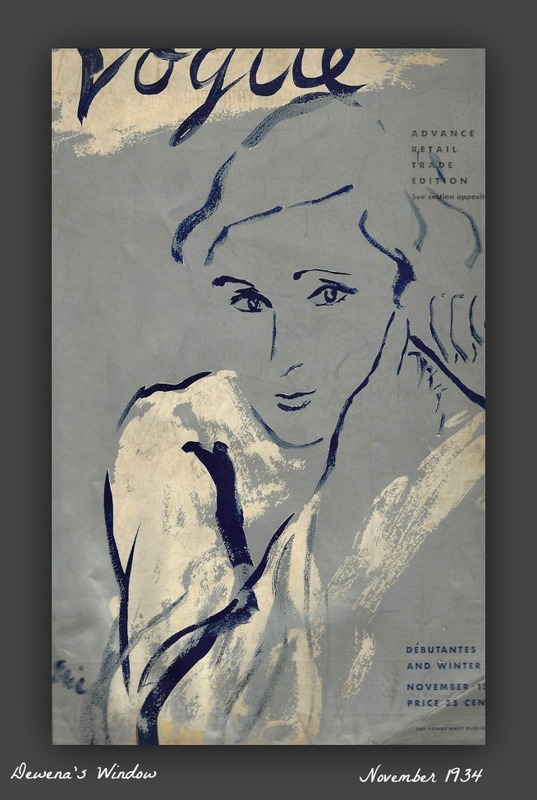 Such a delightful, interesting and heart warming account of your Mother and her travels. I wish we lived in the age of innocence and refinement once again. You've got me thinking of my own Mother wearing a fur coat, with her hair perfectly in place. By the way, I truly love your fresh cut and style. Your mother lived in a cold winter climate too, Jemma, so naturally she had one and of course she looked elegant in it. Her daughter is just like her! 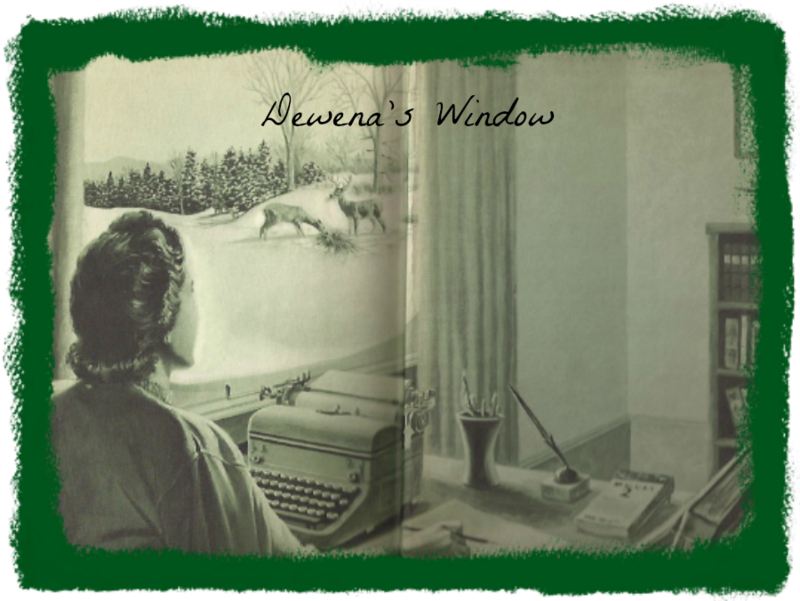 I loved every bit of this post, Dewena! My aunt has a fur hat and a fur collar that she used to wear when she worked in NYC in the 50s. I love hearing about the fashions during the 40s and 50s. Sometimes I think I was born 20 or 30 years too late! It was such an elegant time for women's fashions. We've gotten way too casual in my opinion, opting for comfort (not a bad thing, I guess, but still. . .) I have a heck of a time blow drying my hair straight, too. My friend's husband colors her hair for her -- has for years. I love the NY fashion mags from that time period, Karen. Do you ever write about her time in NYC? Maybe you will in your new 28 day challenge? That's a great idea. I really do need to get some of her stories down. I bought myself a full length fur coat at a consignment shop when in my forties, and I wore it while I worked at night at the theater for years, during the cold winter months. It was as heavy as heck, but I felt VERY elegant in it... it was an "Autumn Haze", remember when they used to be given away on the Price is Right and other shows? One of the ushers was a furrier by day, and she repaired some loose skins in the coat for me. I don't know that I would have the courage to wear it today, but oh, my, what a wonderful coat it was. Of course I remember the Autumn Haze days on the Price is Right! And being older than you, I remember the Queen for A Day show that my mother watched where every woman was given a beautiful fur coat. I had forgotten all about that, so glad your comment reminded me. Dewena, such a lovely post. I thoroughly enjoyed every word. I also grrew up in the 1950's and 1960's. Graduated from high school in 1968. My lifelong friend and I were just chatting on the phone the other day about our mothers and ladies of their generation in regard to how lovely they always looked. We talked about how our mothers always made us wear a skirt or dress to town, never slacks. Regarding the furs, I have a lovely Beaver coat given to me by my mother-in-law. It so heavy that I could only wear it during the bitter cold, which now I opt to stay in on such days. Thank you for the memories, Dewena. Thank you, Sandra! It is so odd to think about my high school years when no girl wore pants to school. Our principal would have sent them home immediately! I bet your beaver coat will come in handy if you ever lose power in the winter at home. But I hope that doesn't happen! 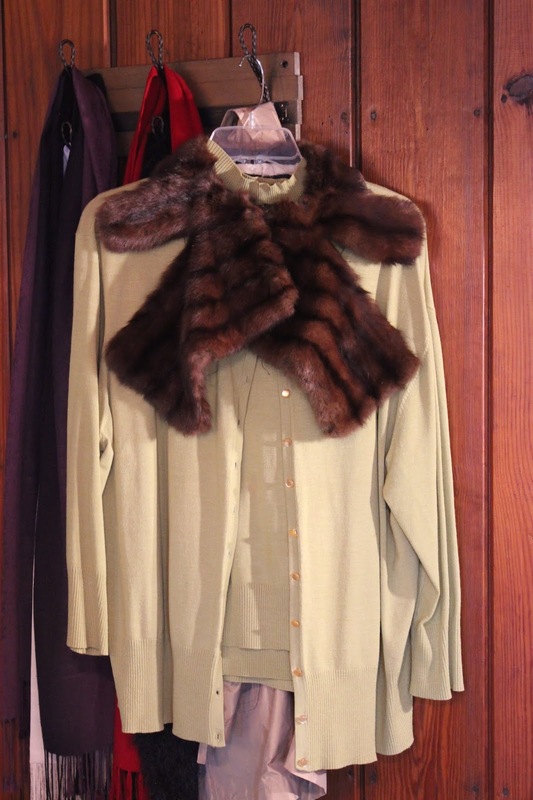 My mother saved her whole life for a mink coat and wore it everywhere once shot got it. It was gorgeous. She also had a beautiful cardigan sweater with a mink collar. It really was another time altogether. Glamorous and elegant dress...I think I was born in the wrong era. I love your haircut, it's glamorous and elegant, too!! Stay warm! Kim, I always loved it when you wrote about your mother and showed us pictures of her. So easy to see that she was an elegant woman! I have a coyote fur coat. To be honest, it is the warmest coat I own and in the temps Wisconsin just had, it was fantastic to wrap up in. I love your hair style. A coyote fur coat? I've never heard of that one but believe me if I could shoot the one who's been coming through our yard, I would. I'm afraid to let our dogs out even in the daytime because he is either brave enough or desperate enough to be here in broad daylight. And after hearing what their method is when they kill a dog or cat I would have no problem at all pulling the trigger. I took my time reading this post because I wanted to savor each word and picture all the details. WOW! What a wonderful day dream I had! That's such a nice thing to say, Christine, thank you! 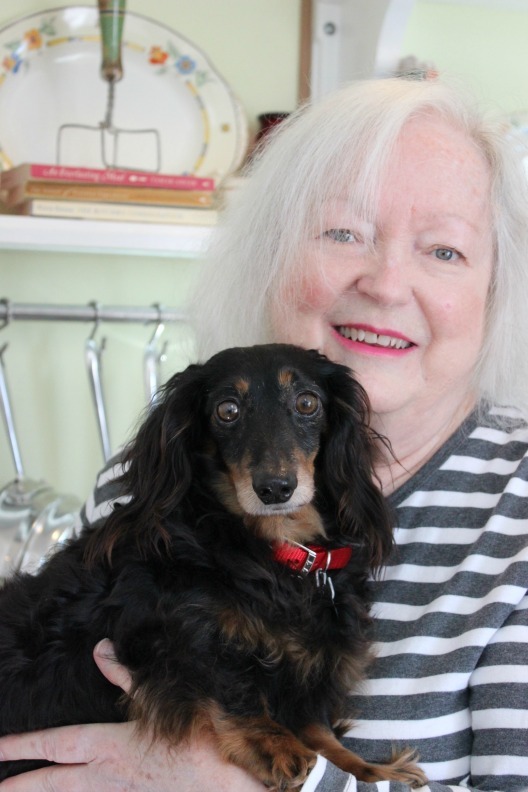 You look so pretty and elegant in your mama's silver mink stole, Dewena. In fact, from a distance, I could swear it was Princess Marina,herself! You basically have the same hairstyle, hair colour, and are wearing very similar looking stoles! Do you see it? I remember chatting about Princess Marina with you. Here is the link I had sent you(https://en.wikipedia.org/wiki/Prince_George,_Duke_of_Kent); went back into our emails and found it - very intriguing stuff, if you recall. Now, I also love the current silvery 'do' that you are sporting in the pic, and yes, RH should definitely enroll for those courses asap; after all, you know what they say, 'Happy wife, happy life'! Your grandmother, mother and aunts look so very happy and relaxed, like a bunch of besties. I see a lovely resemblance among them all, and in fact, I see a little bit of your beautiful daughter in your mom! You can't know how excited I was when you first told me that your mother and aunt had visited Greece, and the fact that they enjoyed themselves. It is a beautiful and magical country that has the ability to make people feel alive! And speaking of Greece, I already miss the climate; we've had as low as -30, with the wind chill, here in Toronto, this week! I am NOT used to such freezing temps, having lived the last 30 years in a temperate climate. BUT, staying warm and cozy indoors, as I hope you are. Poppy, I'm so glad you had a chance to read this. I know you must be having to really adjust again to Canada's cold after sunny and warm Crete. But it must be wonderful seeing your family again. I do remember how much fun my mother and her sisters had when they had a chance to visit. They really were good friends as well as sisters, the same way I feel about my own dear sisters. And you are so right! Christy does take after her grandmother, actually both of them. I think Zack does too, while the other boys, like me, take after my father's side of the family. I am so glad that Princess Marina had a happy and useful life in her husband's homeland. I am fascinated by her! Well, you know how much I enjoyed this post, Dewena, as I am part Greek myself. You look fabulous in your fur coat and there are many treasured pictures of your mother on here. How wonderful that she visited Athens with her sister, and then on to Instanbul. That is something that you got so dressed up in high school. I like your new hair cut, and always wished I had straight hair, but of course, I always had the thick curly hair haha. But I appreciate it even more today. What a stylish picture of Princess Marina of Greece. You must take after your mother with her four sisters, as you have sisters as well. That is a wonderful picture of your mom and sisters. Keep wearing your furs, Dewena. They are so fashionable and timeless. Thank you so much, Sheri! Our family did run to daughters as did yours! Sisters have so much fun together and now you have those two sweet little granddaughters--as do I! That is such a cute story, Susie! And I too remember a lady in our church that I looked up to, as you did her. You just never know what influence you'll have on a young person's life, do you? Your post was so much fun to read and I love all the pictures. Your mom in Greece looked so nice. When Rich’s Dept store closed in downtown Atlanta and their furs went 75% off my husband bought me a mink jacket. I wore it several times but have not for years as I would be afraid someone would throw paint at me. I also bought a fur hat in Russia and would have worn it here in Nashville last week, but it is back in GA, then I did not walk outside! I like the picture of your mother with her sisters. I wish I had at least one sister and living close by. It is difficult to move to a new town, new state when one is older. I know no one in Nashville, but I do talk to my cats! So you're in Nashville now? That's exciting! We haven't had too much weather where furs would be necessary for warmth, have we? And only a couple of dustings of snow. That's interesting reading about Rich's Dept. store. 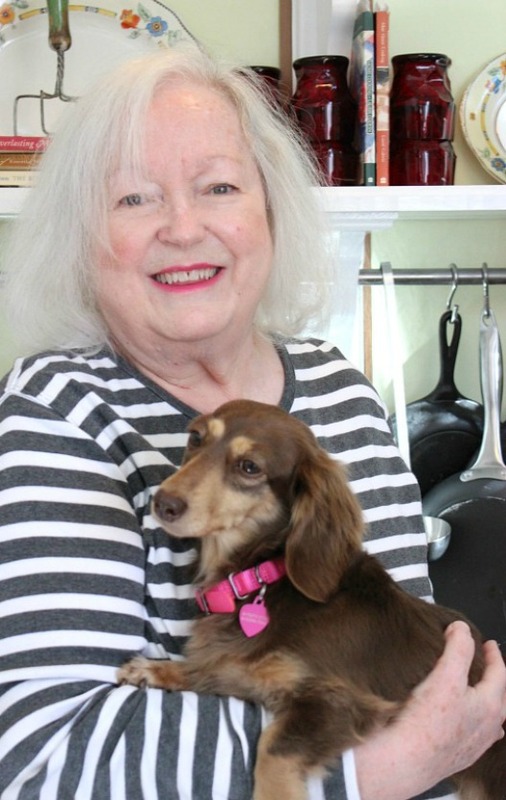 When I think of them I think of Nathalie Dupree who started the cooking school there years ago. I have almost all of her cookbooks and was so pleased to see Southern Living do an article on her in the January issue. And yes, it is difficult to move to another state when you're older. It just didn't work out for me at all when we moved to Florida a couple of years ago. I was so happy to return home to Tennessee. I hope that you come to love it here! Thank you, Zaa! And yes, a good haircut does wonders for a woman. 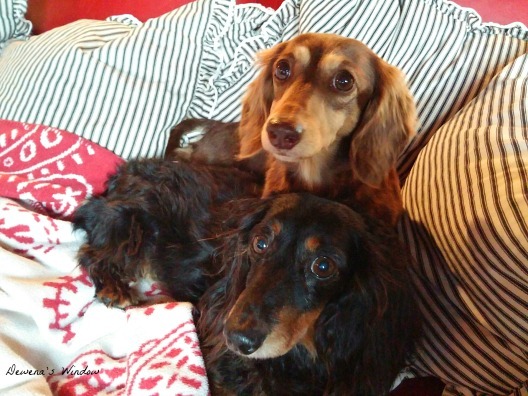 I'm happy that this post brought back fur coat memories to you too! You've brought back memories of my aunts all dressed up in their elegant mink stoles. My mother never had one, but still, how beautiful women looked back then! Elegant is exactly the right word...as pretty as today's women may look, that adjective isn't what I'd used. I loved hearing about the closeness of your mother and sisters. Finally, your hair looks stunning! (I'd like someone to blow dry my hair, and do my makeup everyday, too! What a luxury! Dewena, I love the new haircut! It looks so pretty! I remember my grandmother having a coat with fur around the collar. I always thought it was so pretty and elegant. I so miss the way everyone dressed years ago. Today, everything is so casual...too casual. I constantly see people in the store in pajamas and don't understand why they think that is acceptable! Love and hugs sweet friend! 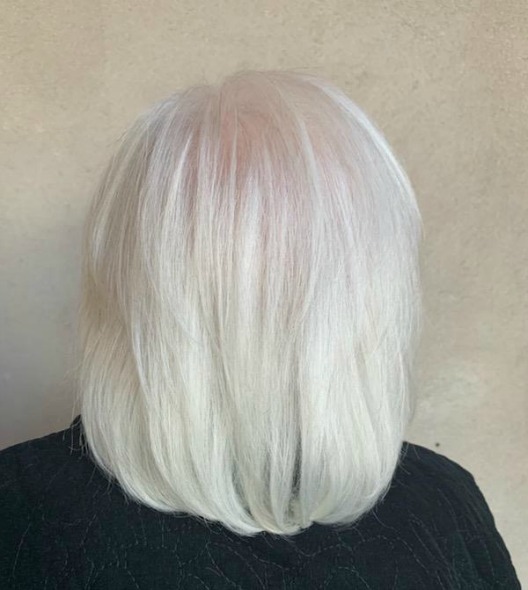 Wow i love this post - the photos, your reminiscing about your mom - your photo of your hairstyle - very pretty - and just an interesting post all around. I enjoyed this glamorous post. People don't wear fur around here, much too hot, and don't really dress elegantly, unless there is a special occasion. I love the elegance of past times, the black-and-white movies of the 40s, the royal houses of Europe, Vogue and Channel. Big sigh. Love the photos of you - both the honeymoon one and the one from last week - equally beautiful. Lovely post and I enjoyed seeing all of the photographs. Your hair-style and you look great. RH and I love your comments! They are sent to my email for moderation first but I do hit publish as soon as I read them. A few commenters' comments are not sent to my email for some reason but I try to visit that section on my design page twice a day to see if they're hiding there so I can publish them. I went the first 3 years of blogging not knowing that was there and when I discovered it there were many pages of old comments that never got published. I was so embarrassed and contacted recent ones but hid in shame from those who had given up long ago. In these busy days I appreciate so much when you take time to comment. Thank you so much! Please visit me at my other blog! What Is the Late Enrollment Rate? From Our Sears Kit Home to Covenant Farm! the little prince is home! HERE and THERE, POSTING, POSTING EVERYHWERE!